When it comes to creating websites, there are typically two sorts of people involved in the process. There are web developers, creating complex and wonderful application backends, and web designers, who take textual markup and perhaps a bit of imagery, and create a beautiful web experience — at least, in theory. 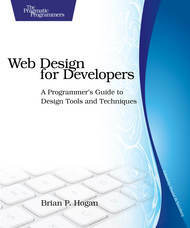 Web Design for Developers , by Brian Hogan, is designed to teach the developers a bit about what it is that the designers do. To provide a bit of background, I’m approaching this book as a seasoned web developer, having worked as a professional in the field for over a decade now. While I am a web developer at heart, I have taken the time to pick up some tricks of the designer trade here and there, though I still fight with the occasional float and mix up my margins and padding. I tried to redesign my personal site once, and I think I made a dozen people blind with my color choices, so I welcomed the opportunity that this book presented me, to learn more about what goes into design — and I really did learn a lot. I only had one or two major gripes with some of the content. As previously mentioned, I have virtually zero concept of what makes for good design, and the book opens up right away with the basics. I found this section absolutely wonderful. Having worked with several designers of varying quality over the years, I’d picked up on some ideas, such as "Grid-based design is good" and "Color choice is important", but I really didn’t have any context as to the "why" behind many of those decisions. Brian Hogan really laid that information out quite well, and if nothing else, I’m pleased that I got to read this section, and would advocate that all developers at least pick up on these basics. The first section was mostly based on theory, and in this section of the book, we move into more application and practice of these skills. Adobe Photoshop is used as the primary tool for creating the logo and mockup and such, but everything is presented in such a way that even if you do not have access to Photoshop, you would be able to fairly easily translate these tasks into other tools, such as the GIMP. Some various photo editing techniques were covered that I was not familiar with, and while I don’t see myself pulling out any image-editing tools anytime soon, I know that I’ll be able to turn back to these chapters if I need to start making some imagery. With regards to the CSS discussions in this section, as well as some image optimization techniques, there’s definitely some good information — but really, for as silly as it sounds, hearing discussion on the importance of semantics and then seeing an example piece of markup that runs completely counter to semantics — well, it kind of soured me for the rest of the experience. An entire chapter is dedicated to working with Internet Explorer and other browsers — and if nothing else, the information in here about IE is quite valuable if you’re not already familiar with it. If you don’t know about IE conditional comments, they’re about one of the best things ever in the battle against old, crappy browsers, and that particular chapter does a great job of covering their use. There’s also some other great content here. An entire chapter is dedicated to accessibility — but not just for the blind. There’s discussion of color choices, hearing-impaired users, and mouseless users as well. Too many people think accessibility means coverage for the blind, but it’s really so much more - even for those of us who simply prefer to navigate sites with a keyboard instead of a mouse. There’s also a couple of sections discussing other site aspects, such as mobile experiences and optimizations that can be made, though some of that seems to go beyond the discussion of web design for developers. Still, some good content here. Finally, it wraps with some "Where to go from here" content, including discussion of some of the CSS grid frameworks. I’m glad that the frameworks were saved until the end, so that the reader has some understanding of what goes into developing a good framework. On the whole, Web Design for Developers really is a solid book. I have to admit, that feeling of frustration that I encountered put me in something of a negative mindset as I finished out the book, but I can’t deny that most of the content in this book really is pretty accurate and useful. More than once, I’ve found myself reviewing some of the basics of design or looking for a CSS trick for IE within the book, which I think speaks to its usefulness. Web Designers and Web Developers are something of an odd bunch. We’re simultaneously like chocolate and peanut butter, working together to make tasty web experiences, and yet, we often treat our two crafts more like oil and water, refusing to mix. I’m not going to go out and pursue a degree in color theory anytime soon, much as I suspect many designers could care less about PHP versus Ruby on Rails, but I do think it’s important that as developers, we pick up at least some basic knowledge about what’s happening on the other side. For that purpose, Web Design for Developers is a solid way to do so.